‘Connecting in Times of Duress: Understanding communication and conflict in Middle Africa’s mobile margins’ (2012-2017) is an NWO-funded research project at the University of Leiden, aimed at understanding the dynamics in the relationship between enduring conflict, hardship, governance regimes, mobility, migration and connectivity. Nigeria, Congo-Brazzaville, DRC and Mali, a region with a shared history of mobility, of oppression and conflict and of connectivity. Within the region the variation in these three variables and its comparisons highlight processes and dynamics of socio-political change. The research programme uses an interdisciplinary methodology, combining anthropology, history, communication studies, conflict studies, and social geography. The subprojects were designed to be comparative and complementary, among diverse mobile populations in urban centers, refugee camps, and remote rural areas and of different types of relations between duress and changing communication technologies. ‘Connecting in Times of Duress’ explores how the introduction of ICTs changes patterns of communication and information flows where people live in duress. More specifically, it concentrates on (a) how, through new communication and information flows people’s experience of duress changes; (b) how new opportunities to be informed, to communicate, and connect, influence individual decision making and the (re)forming of communities; and (c) how these changes influence power relations and existing hierarchies. An important goal is to contextualize these seemingly ‘revolutionary’ and ‘new’ changes related to the introduction of new technologies in a historical longue durée perspective, relating developments in mobile communication to older communication processes in the history of Middle Africa. Click here for a definition of the central concepts duress, connectivity, and mobility, the methodology of the project and the methods employed by CTD researchers. 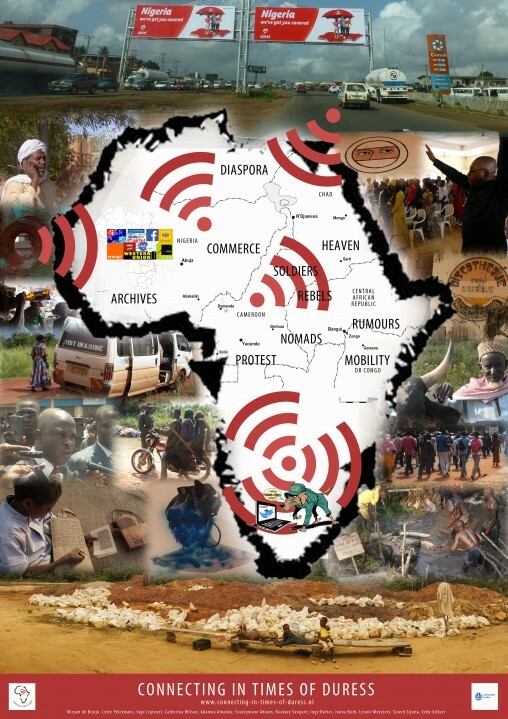 CTD aims to stay closely connected with Middle Africa: in the section Central Africa Now, journalists/ bloggers from the region reflect on the region’s latest developments. CTD researchers also report regularly from the field through their personal blogs. The connection with the region is further strengthened by collaborating with affiliate researchers and students from Middle Africa, and by organizing (collaborative) events, most notable the CTD conference in N’Djaména, Tchad, which took place 23-25 October 2017. The study of connections will be the axis of all projects. For the full version of the (initial) research proposal (2012), click here. Related projects: For more information on the related research projects ‘Mobile Money’ and ‘Being Young in Times of Duress’, the Voice4Thought foundation and the online publication platform Bridging Humanities, click here.